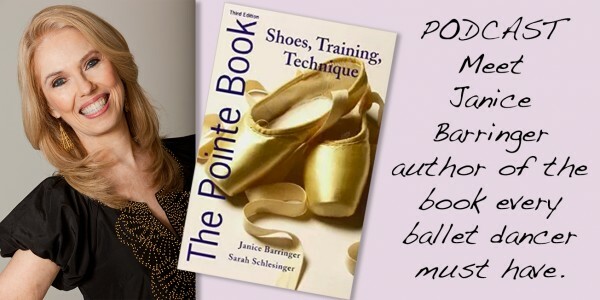 I’m excited to share with you my interview with Janice Barringer, author of The Pointe Book, the world renowned and most comprehensive book on pointe shoes. Every serious ballet dancer should have this book. First published in 1998, the book, now in it’s third printing, has withstood the test of time and has become a go-to resource for the ballet industry. Barringer shared lots of interesting stories about her life in the world of dance. Growing up in Mount Dora, Florida, Barringer’s parents took the one hour trek to the sleepy town Orlando, in the days before Disney. Today I am happy to share you the wonderful interview with Janice Bringer and her experiences with the ins and outs of the dance industry and all of her knowledge from her decades of studying pointe shoes. Click above to hear my complete interview with Janice Barringer, author of The Pointe Book. The most comprehensive book on pointe shoes. Janice Berringer knows when opportunity knocks. This small town girl with big ballet dreams, quickly grabbed a pen and a piece of paper to scribble down a conversation she was having with a big city professional ballet dancer. From what started as typical day in the waiting room of a chiropractor’s office, turned into the beginnings of a world renowned resource for the ballet industry for nearly two decades. Berringer, author of The Pointe Book, brings her rich background as a professional ballet dancer and teacher onto the pages. Berringer started living the ballet life in the 4th grade. She took ballet class once a week in the small town of Apopka, Florida, on the outskirts of the sleepy town of Orlando, in the days before Disney. Soon directors in Orlando started asking her to come to their studio. Barringer’s parents made the one-hour trek to Orlando one to three days a week where she took ballet, tap and jazz. Though she loved jazz and tap, her dream was ballet, and she turned that dream in to reality. As she grew up, her horizons started to expand, Berringer went to Europe to take classes with the amazing teachers that Europe holds. New York was her next step and where she met the well known teacher David Howard with whom she built a life long relationship. Her professional career had it’s beginnings started dancing with the New York City Dance Theater and then to the Baltimore ballet. She also had appearances on the television show PBS the segment “Dance in America” and did some ethnic dancing on the show as well. While working with the baltimore ballet Bringer met her best parter and friend Eddie Stewart. “Eddie was the most incredible dancer ever, he could make any girl look good!” Barringer and stewart hit it off and started to do free lance dancing for over 20 years. Over her career her dear friend Sarah Schlesinger, and now her co-author, encouraged her to take on the many challenges of writing a book on pointe shoes. She even offered to write the proposal and help her write it if Barringer provided the information. But Barringer declined many times. She had no writing experience besides high school. However one day while in the chiropractor office, she sat across from the well known dancer and teacher, Martine Van Hamel. She found a scrap of paper from her purse and walked right over the her and started to ask her some questions about her pointe shoes. And, that is how it all started. Barringer went straight to the sources for her extremely thorough book on pointe shoes. She interviewed pointe shoe makers, top teachers and dancers. She has written numerous articles for dance magazines over the years as well. The Pointe Book goes into great detail about the foot and shoe. And it’s not only girls, but men wear pointe shoe too if their feet are week. Barringer researched every little detail of the pointe shoe and the foot. She has also includes lots of exercises for your feet in the book. Barringer creates many opportunities for dancers with her book. Her talent in describing and teaching about the ever so small details of pointe shoes makes this book a must have for any ballet dancer. “The Pointe Book addresses nearly every question that you could think to ask about pointe shoes.” Dance Magazine. Click here to purchase.